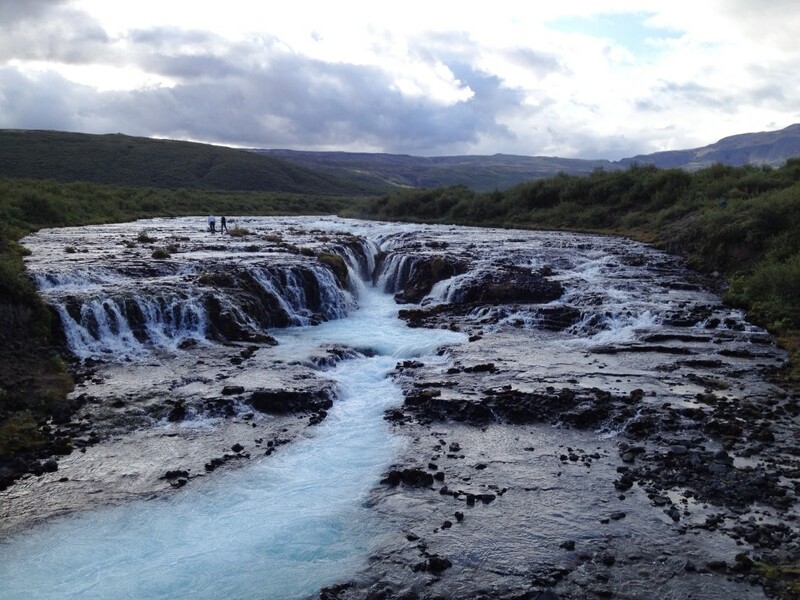 This waterfall, called Brúarfoss [Bridge falls] is one of my favourites in all of Iceland. It is off the beaten track, tucked away inland, with no road save a hiking/horse riding track to access it. I used to rent a cottage every summer very close by, and it would take me about ten minutes to reach the falls on foot. First I would have to cross a river on some stones that were laid there for that purpose, then walk a few minutes through an Icelandic birch forest until I arrived at the bridge after which it is named [and from which this picture is taken]. Usually there was no one around, and I would sit on the bridge and look down into the rapids below, allowing myself to be mesmerized by the rushing water. I haven’t been to that cottage in years, but last year EPI and I were passing by and decided to take a detour to visit our beloved falls. We parked the car near the cottage [which is still there], crossed the river on the stones, and hiked up to the falls. And this was our view from the bridge: two people trying to cross the falls on foot. They had clearly abandoned the idea of going all the way across because they were in the laborious process of turning back when we arrived. Soon they were at the bridge where we were standing, and we informed them [they were not Icelanders] that crossing waterfalls like that was very dangerous; that just a few days earlier a young girl had been badly injured trying to do the same thing [elsewhere] and earlier in the summer there had been two fatalities in a waterfall in south Iceland. They shrugged and said that they had been well aware of the dangers. I had my doubts: those rapids are pretty fierce down below that bridge, and had they lost their footing and been swept down, they would have been toast. Thankfully that did not happen – but this is as good a time as any to remind people that Icelandic nature may look gentle, but can be inexpressibly fierce and relentless. You don’t want to take any chances, and you certainly don’t want to cross any significant waterfalls, or rivers that lead to waterfalls, on foot.